Beth's favorite holiday is Thanksgiving. But lately, it seems as though it has become the kick-off to the Christmas season. 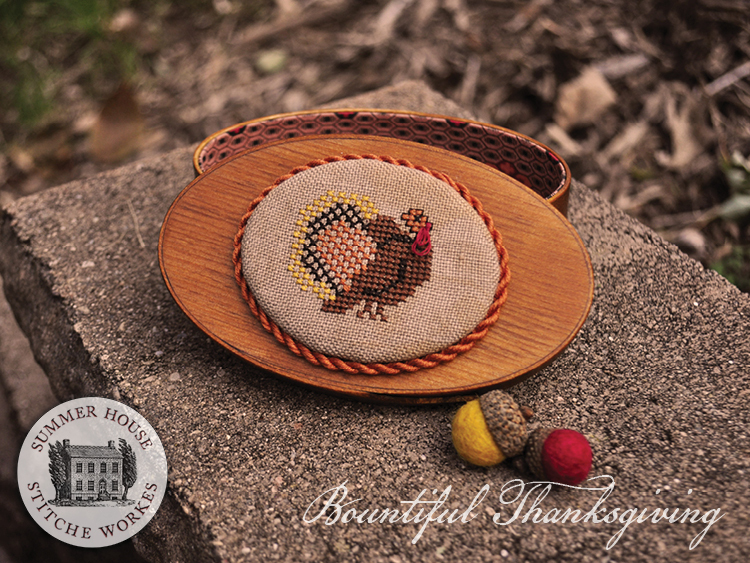 This needlework set takes back this particularly American holiday and celebrates the overstuffed dinner. The three projects are stitched on 28 ct. Ale linen by Picture This Plus with DMC floss. (14 ct. Ale may be chosen as an alternative fabric.) 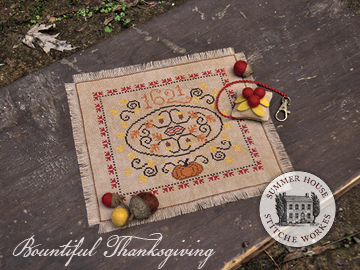 The main course is the lined LeHay Turkey Shaker Box accompanied by the Cranberry Scissor Fob and ends with the Pumpkin Candle Mat. It wouldn't be a "Beth" class if it didn't contain a few little surprises!! The class focuses on finishing techniques, so there will be pre-stitching. Kit includes : LeHay Shaker Box, 28 count Ale linen or 14 count Ale Aida, DMC floss and finishing supplies. that you will receive your pre-stitching class kit . Beth first learned to embroider as a child and learned counted cross stitch from a cousin while in high school. Her early employment at Woolrich, Inc. included several positions from sewer to industrial engineer technician. Working with new garment designs gave here a well rounded education of sewing techniques and construction. After a tenure as a Naval Oficer's wife and her three children were all in school, she returned to the classroom as well, earning a BS in graphic design from Pennsylvania College of Technology. Since then she has worked for a professional photographer and created thousands of invitations as the in-house designer for Bella Figura, a luxury stationer. In 2006, she started Summer House Stitche Workes and now designs needlework full time. Beth enjoys spreading her love of the needle through teaching and meeting stitchers across the country.